Laughing from Sarah on Vimeo. Yes, I realize he stops laughing after fifteen seconds and I tape another twenty seconds hoping for another laugh. Oops. Still, Boo and Missy sound pretty funny. The entire video warms my heart. I am off to bed. All well wishes and prayers for my mom are really appreciated. She got released today and stayed the night in-town with my little sister. I am off work tomorrow to help her and we are going back in to see the doctor. They are removing some packing (horrible stuff, but I won't go into that) from her nose and we will see how the bleeding goes. Hopefully she will have finally clotted and the worst will be behind us. Hopefully, hopefully. My poor little Mommy. We are back safe and sound! We had an amazing trip. It was just perfect. I have a million pictures and stories to tell, which I will post later in the week, but for now I am just trying to get the laundry done and ready to go back to work tomorrow. So for tonight you get one of me and sweet Henry out and about in the windy city! Sorry I have been sorta MIA this week. Out Internet has been acting up. Annoying. Anyway, we are now heading out the door for Chicago! So excited for our weekend away. 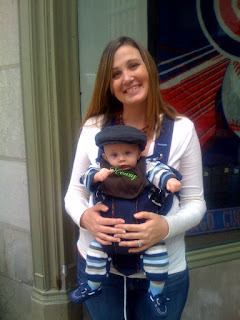 We got Henry a special hat to match his Papa's and everything...a boy needs a hat in the windy city! I go back to loading dishes. I seeing the movement again out of the corner of my eye. Yes. He is THERE! Oh Lord, he is about to GET ME! I spin around again...nothing. I turn back to the dishes. Confused. Then I see it. The "movement" It's...it's...my own shadow. YES. I actually jumped (TWICE!) at my very own shadow. Nick was studying on the couch, completely unaware of what a baby his wife has become...it was just me and my terrifying shadow. SHAME. I am taking Henry on a road trip. Friday we are heading up to Chicago to visit one of my best friends. She has lived up there forever and I always want to visit, but rarely make it. Back when I was pregnant she told me that there was this Harry Potter exhibit that would be in town from May to September and I laughed at the idea of actually making it. I told her that even though I am the biggest Harry Potter fan ever (nerd, remember? Not even a little bit embarrassed) that there would be about a 1% chance of me bringing a new baby to Chicago for a weekend. Then...well, Henry was born. And he is just so sweet and easy. He doesn't mind being in the car. He loves his stroller and his sling. He is happy pretty much anywhere we take him, so I wasn't as against the idea. Then my little sister mentioned that she was going to Chicago to spend the weekend with one of her friends and I jumped at the chance for company in the car. So...before I knew it I had said we were coming (my big sister too...because she could NEVER miss a road trip!) and just like that Henry is going on his first big trip to see the windy city. Hopefully he will do okay in the car for six hours. Hopefully he will sleep okay in a pack n' play. Hopefully he will be as good as he is at home (as he sits right now in my lap as I type this, just smiling up a storm and sucking on his thumb) but even if he is at his worst, I know I will enjoy myself. As soon as we decided to go I just got so excited. I need this trip. I need the girl time and the chance to catch up with my sweet friend. I need to get out of town and to just take a little break from home and chores and work. We will miss Nick, but it will be a great weekend. Especially if Henry is good! Keep your fingers crossed for me...and if you have any advice for traveling with a four month old I would LOVE to hear it! Well, for the first time in Henry's life he had something to eat besides breast milk! Very exciting for everyone. I have felt like he was ready for food for the past couple of weeks, so I was so excited to give it a go now that we got the green light from his doctor. Turns out that he loves cereal. LOVES IT. At first he was all like, "ummm...what the hell is this??" after a couple of minutes it turned into "Yeah...I could get into this!" And finally he was all "NOM NOM NOM. This is DELICIOUS!" He was so happy and would laugh and talk between every bite. I told Nick to take a video towards the end, because he was SO into it and just so darn cute. Henry starts the video off by burping (that's his Papa's boy!) and then of course he loses all interest in food. He realized the camera was on him and he can't take his eyes off it. Also, he falls over in his bumbo seat. I swear he can sit in that thing...clearly he was distracted. And I guess I was too because I let him just slump all the way over to one side. Bad Mama. Anyway, LOOK!! A new Henry video!! First Food from Sarah on Vimeo. So when I was home with Henry yesterday I happened to be walking through the living room and looked out the window and saw this adorable, fit, red headed girl jogging down our street. I did not see her once, not twice, but THREE TIMES during the day. THREE TIMES she jogged down my street (that I saw...lord only knows how many times she ACTUALLY ran down the street...). Her ipod ear-plugs were in and she wasn't even out of breath. Just out for a lovely jog on a nice fall day. Although I personally did not jog on Monday, I did consume an alarming amount of pasta...and three oatmeal cream pies. They are healthy because they are oatmeal. Don't get me started. I will fight you to the death on this matter. HEALTHY. *Once, when running for the track team, the coach informed me that I ran like a shot chicken. This was in the hay day of my physical fitness...so really I can only have gone down from there. *Another day on the track team (oh all the memories) I was doing conditioning, and a teacher of mine drove by. the next day she asked if I was okay, because I looked "close to death" while running around the school. This was well into the track season and I was "fit". *I have sports induced asthma...but I have an inhaler around here someplace. *I haven't consistently exercised since middle school. *I tried to jog once back about a year and a half ago. Yes, just the once. I got on adorable work-out clothes and set my ipod to some "pump you up" play list. I figured I would jog one song, walk one song. About 25 seconds in I thought I was going to die. I did a 3min walk, 30 second jog cycle. I was sore for a week. I haven't been back out since, but I do still ejoy the playlist. *I am very clumsy. Good chance I will bite the dust. Okay, so there is my list. Still, I keep hearing about this couch potato to 5K thing...and I am tempted. Really tempted. I mean, how hard can it be? I just gotta run...that red head can do it. I think I am going to give it a go! Not much time to talk today. Henry had his four month check up, which means he had his four month shots. His little face is just so pitiful when they stick him. He was all smiling and looking around at everyone, happy as a clam, and then BAM. NEEDLE. So...he is fussy and sore and basically needs his Mama. I just laid him down for the first time, so I now need to pick up the house and get ready for my sisters birthday dinner! (Happy Birthday Boo!!) Should be fun...assuming Henry is able to handle PF Changs. Anyway, just a quick post to record his four month stats so I don't forget! Weight 11 pounds 13 ounces (5 percentile)...he is a skinny little guy! So our little guy is still on the small side, but we expected that. The doctor was very happy with his growth and said he was perfect. We already knew that, but still it is nice to have the experts opinion! This morning I woke up and realized it was later than normal. I went to your room, surprised that you hadn't woken up hungry, and peaked over your crib. Then I saw you, my perfect little boy, wide awake and playing with your own feet. You looked up at me and gave me your big toothless smile, and my heart melted. You were so content in there, on your own, just waiting for me to wake. I picked you up and your little hands grip my arms and your little head fell onto my shoulder. The start of morning hugs. You are changing and growing all the time. I told your Papa recently that you have moved from a newborn to a baby. You now know what you like and dislike, and you make sure to let us know which is which. You are quickly growing out of your swing, but love your seat because it allows you to look around so much more. You have discovered so many new uses for your play-mat now that you can hit the toys with your feet and hands. We watch you lay there full of concentration as you work to hit the rattle. It is amazing to watch you learn. You now grab for anything and everything in reach. You love your rattles and all toys that make noise. You love to put anything and everything in your mouth...except your passie. You are quickly outgrowing the passie, which I know is good, but somehow makes me sad. Recently you have started talking. Not just a little baby chatter, but a LOT of baby chatter. You talk all the time. You will carry on complete conversations in a language only you can understand. You love when we talk back. When we continue a two sided conversation with you, you break out into huge smiles, and then we hear that sweet little laugh that melts our hearts, and then the talking is going again. Your talking is high on the list of my favorite things about you. A list that grows everyday. Oh how I love you. The word love doesn't really seem to be strong enough. Everyday I look at you and thank God for letting me and Nick be your Mama and Papa. For giving us such a sweet and loving little boy. So...perfect. Your smile warms my heart. I love you my sweet sweet Henry. PS. Maybe next month you will be willing to share that sweet smile in some pictures! Eight years ago I sat in my little one bedroom apartment and watched our nation change. I watched my generation grow up. I watched one of the most defining moments of our countries life. For days afterward I watched. I watched the families looking for loved ones. I watched our nation come together. I am not a great writer, and people can and will speak of this day much better that I ever could, but I can say that I was moved. Moved beyond words. I remember thinking that this day should be a national holiday. A day set aside to remember. I thought it was strange, almost wrong, as people went on about their days as normal in the years that passed. I don't know what I wanted, but as previews came on the TV for movies and their release date was September 11th, I thought "How odd...what a terrible day to choose". When my brother-in-law graduated, his graduation date was September 11th. And again I thought, "Why not choose a different day? Shouldn't it be a day to remember? A day to morn our countries losses." I know the world and life cannot stop, but I felt it could at least slow down. Out of respect. Out of morning. To remember. Then there was last year. Last year on September 11th I had my egg retrieval. The day that Henry was made. The day that my six other little embryos that are frozen were made as well. One of the most important days of my entire life. I thought very little of our nations past on that day. I thought only of my families future. Of our hopes and our dreams all riding on one day. On September 11th. Now the date has a double meaning. One of the saddest days in our nations history. And one of the happiest days of my life. I still think it should be a day to remember. I just now have more things that are worth remembering. And now I understand a little more that life goes on. That we cannot all just stop our lives to remember. We do better remembering by living our lives, not by standing still. I learned something this weekend. Now that I have Henry, apparently I feel no need to take pictures of anybody else. That's right. Not a single other person was photographed by me this weekend. Clearly Henry is all I see. Maybe I should work on that a little... I learned another fact this weekend. I can get Henry to smile 99% of the time. The 1% of the time that he wont smile is when I have a camera pointed at his face. LOOK! Ellie and Henry in the same picture! Yes, she has devil eyes and yes he is TOTALLY uninterested in her, but it's a start. Every other time we tried to take their picture Ellie ran and hid under the bed. Hanging out in his lounging clothes on Labor Day. Adorable (nerdy) onesie given to us by my friend and Bio Girl reader Danielle! Thanks so much. We love it!! So, in sum, we had a perfect holiday weekend. We spent time with family (not pictured) went over to peoples houses (also not pictured) and had an all around relaxing and wonderful time. Hope you all enjoyed it too! My mom came down with the flu last week. As it turns out, she tested positive on Wednesday afternoon. Just a couple of house after Henry and I came to have lunch with her at work. Of course she held him and kissed him and loved him all through lunch...as any grandma would! She was so sad when she called to tell me she was positive. Not worried about herself, only worried about the sweet boy. I, for one, was VERY worried about my mom! She has Rheumatoid Arthritis (which, in case you don't know, is not like normal arthritis, but is just a horrible autoimmune disease) which has been giving her issues for quite some time. She is on a medication which suppresses her immune system, so the last thing she needed was the flu! Anyway, she was worried about Henry, the rest of the family was worried about her. 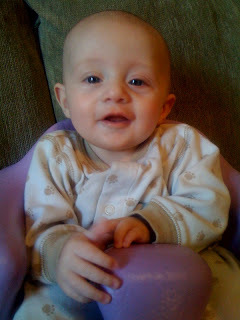 Still, I wont deny that I was not excited about the idea of a four month old with the H1N1 flu...not at all. I mean, flu is horrible for someone who understands why they feel that bad. What do you do for a baby that has no idea what is happening?? Sounds like a nightmare. For him and for us. Well, I am happy to report that after three days of paranoia around here (every little sniffle or upset stomach, body ache or exhaustion led to ,"Oh here it is! the SWINE flu!! HORROR!!!) We have passed the incubation period and are flu free! I have never been one to worry about getting sick, but clearly having Henry has changed that. I mean, when I got sick before him I could crawl in bed and feel like I am going to die. Not fun, but at least the only person I had to worry about was myself. Now when I think about the flu my first thought is how I don't want him to get it. How I don't want him to be miserable. And then...oh man...how I don't want to get it AND him get it at the same time. Because that sounds like Hell. Looks like this will be the first year I will bother to get my flu shot. We had our fantasy football draft last night...Henry was VERY excited. Draft Day from Sarah on Vimeo. For those of you that say, "that was EXACTLY like the last video!" I say to you, "NO WAY! It was TOTALLY different...I mean, he is in his Jammies! and he is in his chair! And...and...just TOTALLY different!" Henry started out the draft strong...full of smack talk and everything. Henry says, "You think you can take ME? You got NOTHING on ME!!" so he passed out around the eighth round. Rookie. Thank you all so much for your sweet comments. Our pets are such a part of our family. It is just hard to imagine them not being here, especially after seventeen years. I talked to the vet and they said that the blood was most likely just him busting a blood vessel. That as long as he is still eating, drinking and walking around that he is okay. He said to keep an eye on him. He said basically what you all said. Is he having more good days or more bad days? That will be the real question. For now, I am not ready. He is not ready. But still...I don't think we have a lot longer with our sweet old man.